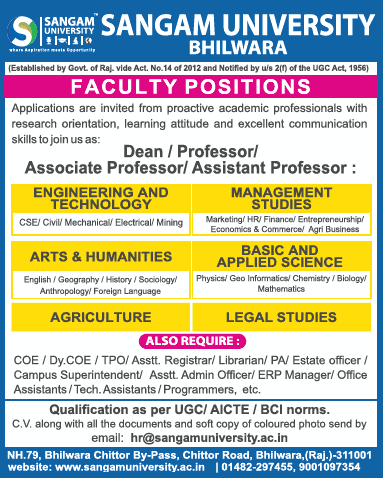 Sangam University, Bhilwara has advertised in THE TIMES OF INDIA newspaper for recruitment of Teaching Faculty- Professor / Associate Professor / Assistant Professor / Dean Plus Non-Faculty jobs vacancies. Interested and eligible job aspirants are requested to apply immediately from 27th July 2018. Check out further more details below. About University: Founded in the year 2012 with state-of-the-art infrastructure and facilities on the belief to resonate as one among the best universities of Rajasthan. We meet the demands of a new kind of society, corporate and professionals. Our degree programmes and foundation years have always been distinctively challenging, flexible and foster a broader based knowledge. Our interdisciplinary approach doesn’t just reinforce a wonderful education but empowers our budding professionals.